Unorthodox braids can only be made (easily) by fingerloop braiding. This isn’t very common—most braids can be made by more than one braiding method. To a somewhat obsessed fingerloop braider like me, this makes unorthodox braids a very special type of braid! The classic, worldwide favorite Unorthodox braid is the “broad lace of V bowes” of the medieval loop braiding manuscripts. This 5-loop unorthodox braid is apparently even more widespread than the 5-loop square braid. According to Noémi Speiser, in places where only one loop braid is known, it is invariably this 5-loop unorthodox one (or one of its close relatives). That’s because it is even easier to make than a square braid. Slentre loop braiding of Denmark and the Faroe Islands is an example—this braid is the only one known from the Slentre fingerloop braiding tradition. Unorthodox braids have peculiar braiding structures that are hard to diagram but easy to braid: Typically, instead of going through all the loops on a hand, the operator finger skips over one or more of them. This is a common mistake when making a square braid. In an unorthodox braid you just do it on purpose — and consistently throughout the whole braid. Two 11-loop unorthodox braids. Underside of top braid is solid orange, of lower braid is solid black. These two are D-shaped braids. [NEW: I now have a video tutorial for a 7-loop D-shaped braid with this color pattern]. The resulting braids usually have a different appearance on the upper vs lower surface. They can be domed, convex/concave, or beveled in shape. 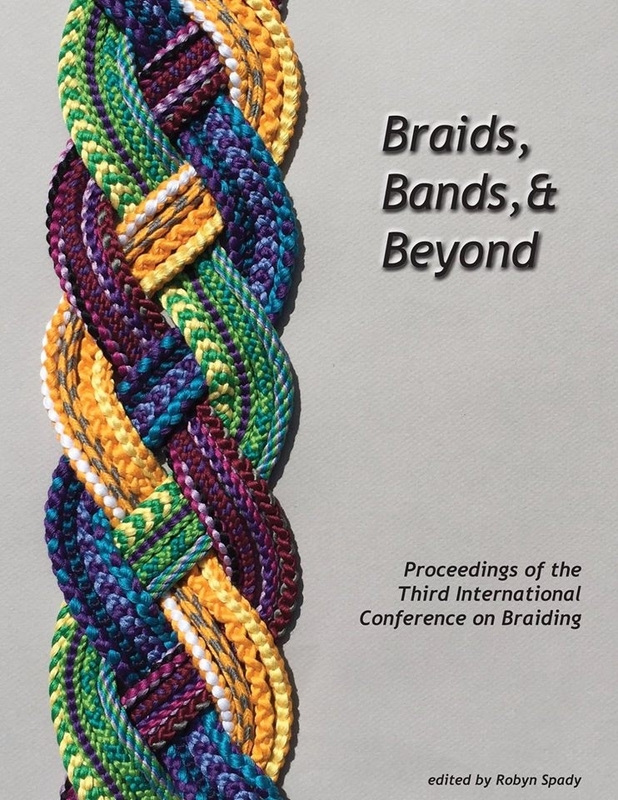 When making an unorthodox braid, turning versus not turning the loops doesn’t have exactly the same results as with square braids or double braids. Unorthodox braids can’t be made to divide into two separate layers. And they cannot be braided so as to open up/ unfold like the flat version of a square braid. Turning or not turning the loops does result in color pattern differences (when using bicolor loops), and may slightly change the overall shape of the braid. A 5-loop unorthodox braid has one left and one right loop transfer in each braiding cycle, so it feels very similar to making a 5-loop square braid. The only difference is that your finger only goes through one loop instead of two (on its way to fetching the same loop on the other hand that you would fetch for a square braid). You simply skip the other loop. It’s so easy to skip a loop that the braider doesn’t think anything of it. But that skip isn’t a “nothing” in the braid’s structure. In combination with the “through” move through the neighboring loop, it’s actually a very complicated thing to chart out, and would be very hard for a braider to accomplish if braiding with free ends, or bobbins, or even hand-held loops rather than loops on fingers. That skip causes the braid to not form on two layers, like square and double braids, yet not be a simple one-layer braid either. Instead it’s, um,…complicated! If you use more loops than 5 to make this type of braid, things get even more interesting. The more loops you use, the more combinations of over, under, and through-loop moves are possible. Each combination makes a different braid structure. In terms of general shape, braids made with various combinations of both “over” and “under” whole loop moves tend to be flat (and solid, not thin and flat like a square-type flat braid of only one layer). Some of these combinations result in braids are quite different in appearance—unlike square braids of more and more loops, where all you get is a bigger square braid—the exact same structure, just with longer floats on the 4 ridges of the braid. It’s the combination of “throughs” with “overs” and/or “unders” that create the complex braids that Noémi Speiser christened “unorthodox”. She doesn’t ever discuss any two-pass unorthodox braids of more than 5 (or 7?) loops, though. It might actually be the case that some of my unorthodox braids of many loops (but only two loop transfers) have never been braided before. This isn’t because no-one else would be able to think them up! But back when loop braiding was widespread and common, there would be no incentive for a single braider to bother with using more than 9 finger-held loops. Braids of many loops can be made much more efficiently by several braiders co-operating on one braid, than by one braider using “too many” loops. And apparently that’s what braiders did in previous eras. However, braids done by multiple braiders rarely have only two loop transfers per braiding cycle. It’s much more common for co-operating braiders to each make two loop transfers, so 4 in all. (Or even to make four each, as in so-called “spanish” braids.) In any of these braids, each transferred loop only goes through one or two other loops…so not a lot of possible through-over-under combinations. On the other hand, it’s very intuitive and natural for a solo braider to make 2-transfer braids. In other words, one loop transferred on/ from the left hand, followed by a mirror-image loop transfer on the right hand. If each hand is holding several loops, there are many possible combinations of “through,” “over,” and “under” braiding moves the transferring loop can make. Some of these braids look similar to each other, but there are quite a few very different-looking ones. At some point, I hope to get around to posting about some of these fun unorthodox braids of many loops. If you are interested, you can experiment and find some on your own. My 9-loop and 11-loop tutorials have a little info about possible unorthodox variations in the ‘notes’ sections following the tutorials. Leave a comment below or contact me by email if you are interested, and I can give you some more info, plus maybe scrape a post together a little sooner—ie a real tutorial, with photos and video. Try out various combinations of “through”, “over”, and “under” whole loop moves for the operator finger to do on the way to taking and transferring the loop (the highest loop on the other hand, for a V-fell braid, which means the index or thumb loop). It’s best to be consistent within a braid—stick with one combination per braid, so you can really see what kind of structure it produces. In other words, on both sides follow the same pattern of through’s, overs, unders for each loop-transfer. Mixing regular “through”-loop moves with “under-whole-loop” moves will give an identical result to mixing “through-loop” moves and “over-whole-loop” moves. That’s because the “under” moves are “overs” when you look at the other side of the braid, and vice versa. This type of combination will tend to result in variously D-shaped braids (or peaked/ triangular braids). The main difference between the over and the under versions being whether the upper or lower surface is the rounded one (assuming you switch the direction you turn the loops! – see below). Using both under and over whole-loop moves (along with “throughs”) creates flatter braids. Both ways make great braids. Another interesting factor with unorthodox braids is the direction you choose to turn your loops. Turning the loops from above versus from below makes much more of a difference to the appearance of an unorthodox braid than to a regular, orthodox square braid. (This is actually quite related to what I already mentioned about “overs” being “unders” when viewed from the other side.) It’s worth trying any unorthodox braid both ways—you may prefer one result over the other. European Loop Braiding: Investigations and Results–Part IV: Track Plans as a Tool for Analysis; and Applications of Loop-Manipulation Braids, by Noémi Speiser and Joy Boutrup, published and edited by Jennie Parry, 2011. See my information page on Noémi Speiser’s books for more information, including where to find them. **Other odd combinations of moves qualify as ‘unorthodox’ too, such as going under a loop, or through one or more loops “backwards”. See full copyright restrictions and permissions at the bottom of the sidebar (if you are on a small screen, the ‘sidebar’ may appear at the bottom of the screen). Content of this website may not be posted or “reposted” online, sold, or used in fee-based workshops without my permission. It may be shared off-line with certain restrictions – see full copyright info.